My mom taught me a few tips and tricks when it comes to making burgers. And one exceptional secret weapon. Which I include in this recipe. The added butter makes these burgers irresistibly moist. Make the spice mixture by mixing the Worcestershire, olive oil, garlic and onion powders, salt and pepper together. Add the spice mixture to the ground chuck. Massage the mixture into the meat. Create six tennis-sized balls with the meat. 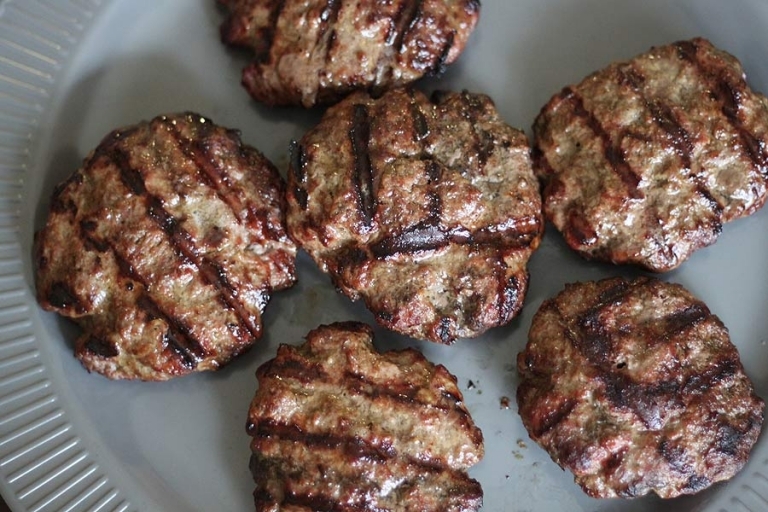 Compress the meat with your thumbs to create patties. Take a pinch of meat out of the center of each patty. Reserve the meat. Add a cube of butter to each patty. Replace the removed meat back to each patty, fully covering the butter. Grill the patties on high heat. 6 minutes on the first side. 4-5 minutes on the second side. Let meat rest for 5 minutes. Serve with your favorite veggies and condiments, and bun. A Clever Way to Have a Homemade Meal Away from Home! Let’s Celebrate with Cherries Jubilee! A LEGENDARY Strawberry Pecan Pretzel Salad Recipe Just For You! Cucumber Bumper Crop: How to Turn a Curse Into a Blessing! The Secrets Behind the Grocery Store That’s Taking over the World! Self Rising Flour: What is it Good For? Most amazing picture of a Falcon!